Welcome to Hooked on Glamping. If you are looking for something unique, individual, and hand crafted in the UK for your glamping decor, you will be pleased to have discovered Hooked on Glamping! We not only specialise in pole attachments, but aim to make your Bell Tent glamping decor as individual as you are. ​The Glamp Clamp™ Hooks and hangers can be fitted anywhere you want hooks on the central pole of a Bell Tent. Large Low Level Party Table - 1200mm diameter. We aim to be innovative in our decorative solutions to meet the needs of the DIY glamper, glamping provider and event glamping experiences - especially those with Bell Tents. We also have unique products for all campers/glampers. Easy to assemble and disassemble around the central pole. Stores flat and easy to transport in 8 individual pieces. ​Can also be used as bedside tables. Please contact us for your individual requirements. An easy to install, flat packed, attractive lantern that hangs around any pole. It is quick to assemble and remove. Now with LED battery lights, compatible with solar packs and comes with remote control. Includes Chandelier Hooks to enable your lantern to hang around the pole. The pole table comes in two halves which link into each other around the pole and are held in place by our patent applied for Glamp Clamp brackets. .
A low level party table with a 58mm diameter hole for the pole. 12000mm diameter. 'tachiht's are attached to the ends of your bunting ribbon to enable the bunting to quickly attach/detach to guy ropes, keeping it taut. Tangl3 is designed so you can wrap your glamping fairy lights around the notches for quick, easy tangle free storage. Great for Xmas fairy lights as well! Used around Bell Tent poles, Garden Parasols, or any other suitable pole structure, holds 40 cupcakes, and can present cream teas, desserts, canapes, chocolates, biscuits, favours, and even cucumber sandwiches! Stores flat and assembles around the pole when required. All you need for a Glamping Trip in a hand crafted plywood box! Providing an individual service to meet your needs, with custom designs and pieces to your specification. 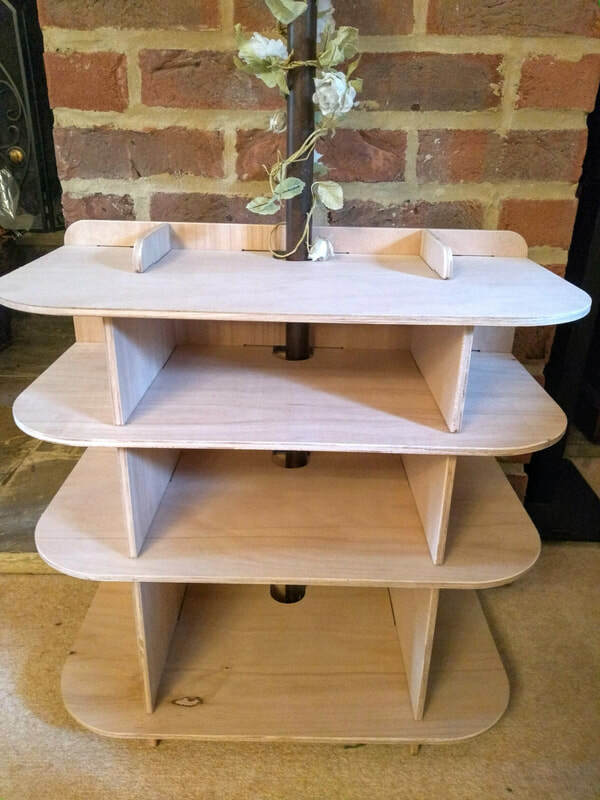 All our products are unique and designed by ourselves and either manufactured or hand crafted in Great Britain - we use FSC ply where possible and can use other sustainable woods. Let us know if you have a particular material you would like us to use, and we can give you an individual quote. Our Sustainability Policy means that we reuse packaging and make our own cardboard boxes out of recycled cardboard where possible. Our hooks and hangers are designed to last and wont bend.